They’re talented, driven, dedicated, and smart. And execution of strategy and tactics rests solely on the shoulders of the Executive Team. Its effectiveness can make the difference between corporate success and failure. As an executive coach/executive leadership advisor, Johanne Bouchard’s support as a trusted confidante has proven invaluable to numerous Executive Teams. She’s been there — having been in the roles of Chief Marketing Officer, VP Marketing and VP International for public and private companies. She knows the responsibilities and the challenges of leading people and having to work with other leaders across functional areas. The fast pace of organizations generates constant pressure to stay on top of individual departmental priorities and to ensure that the members of the Executive Team are in alignment. Johanne orchestrates powerful strategic planning sessions and leadership bootcamps to align executives on strategy and to empower them. 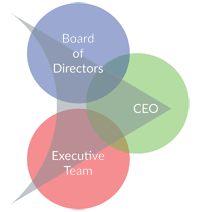 While the Board of Directors interacts directly with some members of this team, it often doesn’t have the greater picture of the team’s ability to execute, the relationship of the team members with the CEO and the pressures that the team is under to deliver results. Both the Board and the CEO benefit from a third party’s assessment of the Executive Team.